With no contractors in place to build the South Fraser Perimeter Road (SFPR) highway as proposed in the Gateway plan but the Ministry of Transportation have begun early stages of bull dozing and laying sand along portions of the proposed route of the controversial South Fraser Perimeter Road (SFPR) highway. Brad Major, a local fire fighter, and professional arborist has started a small business growing Christmas trees on his families beautiful 1 acre property. Brad lives in the a lush valley close to burns bog which is in the trajectory of the proposed SFPR highway route in North Delta on the banks of the Fraser River. Brad is one of the residents who have been told that his property will be expropriated by the provincial government to make way for the proposed SFPR highway which would connect Delta Port to Highway 1 as part of the Gateway Project. He was contacted a week before Christmas last year by the Ministry of Transportation by phone and told they would remove him out of his home within a year. This Saturday Brad will be planting some of his Christmas tree seedlings in the path of the highway as part of a reforestation project on his property. Brad plans to sell Christmas trees to families and then the tees would be planted on his property after the holidays if the highway has not gone ahead. Brads business would help provide a carbon friendly Christmas for families and a healthier habitat for species in the Fraser River, Burns Bog ecosystem. Drop by this Saturday at 1pm at 11059 River Road for a BBQ and a family friendly tour of Brads property and tree farm. Come see first hand a piece of what is threatened by the Gateway Project highways. Plant a tree and check out where our Christmas trees could go if the valley is saved and the highways are stopped. Check out this video for more on Brad and his home at risk. How can you tell when Gordon Campbell is lying? His lips are moving. He said that there have been concerns about the air quality impacts in Burnaby but that improving the transportation corridors will lessen the environmental impacts. Except of course when you look at the government’s own submissions to the Environmental Assessment you realise that they based this forecast on the assumption that the total number and distance of trips in the future is exactly the same without and without the project. The project itself also forecast an increase in greenhouse gas emissions. And that only happens if you burn more fuel – which means more emissions not just of CO2 but common air contaminants as well. What Campbell wants people to believe is that widening a freeway reduces traffic congestion. This is untrue. Whatever the short term effect is due to faster trips just after opening is more than offset by the new traffic that is generated by the facility. Traffic expands to fill the space available. Trips that are currently deterred by the prospect of having to deal with congestion will start to be made. More trips – and longer trips. This has always happened every time a new freeway or expressway is opened in urban areas. After years of freeway expansions people began to realise that the loss of neighbourhoods to construction of ever wider roads was not compensated for by any great advance in mobility. And most places then stopped building and widening freeways – and gradually urban areas improved and stabilised as a result. Some even grew vastly more popular and successful – downtown Vancouver being one of the few major cities in North America that was spared the destruction of a downtown freeway. Indeed we keep asking – and have yet had no answer – where has this policy ever worked? Just one example would do. And that means, dummy, no more freeways but build the transit first. You cannot walk to work in a highway oriented suburb: that is also why Surrey has a transit mode share of 4%. The so called “transit plan” would see SkyTrain reach Langley by 2030 – after more than 15 years of the impact of an expanded freeway. Yes we want “healthy, livable urban communities” and you only get those when you give people an alternative to driving – not encouragement to drive more. And if the freeway is widened, it will look much as it does today – only more so. More low density subdivisions, more plazas, more highway oriented development. Because you will never get transit oriented development until you build the transit. The “urban development strategy” here is simply to keep on repeating the mistakes of the past and expecting a different outcome. What the much expanded freeway will do is dump lots more traffic into the areas around the freeway exits. All those new trips generated by the vision of vast swathes of empty concrete have to start and end somewhere. So the street networks that feed and drain the freeway will see much heavier demand. If you think line ups on 152 Street in the early morning are bad now, you ain’t seen nothing yet. The citizens of Burnaby are right to be worried about where the traffic coming off Highway #1 will go – because it will go through where they live. The great thing about building roads is that it creates more demand which means you have to build more roads … and so it goes. That has been the history of North America in the last sixty years or more. Most people in this region recognize that every new freeway and bridge has resulted in more traffic – not less. Most people when asked recognise that we have under invested in transit in this region and think we should be correcting that mistake. The money spent on this one freeway project could bring light rail transit to most of Surrey and Langley. As Gordon Campbell himself noted with respect to the Canada Line – two railway tracks provide the same people moving capacity as ten lanes of freeway. (Actually most places that build rapid transit expect rather more than that.) So if that is true in Richmond why isn’t it in Surrey? Which is, of course pretty much along the lines of what I wrote earlier this week when the Mayors said they want a slice of the carbon tax revenues. They do not want to keep on raising property taxes – which is what they have had to do as the province has steadfastly refused to allow them to collect new taxes – and the one they did get through (on parking) was snatched back. I cannot say that I am in favour of dedicated taxes either. That is the kind of arrangement that was made in the US when their national gas tax was introduced – it could only be spent on roads. That made it more palatable to the people paying the tax but it quickly became apparent that road building can never satisfy the demands from drivers for more roads. Because traffic expands to fill available capacity very quickly. So the law had to be changed to allow for some transit projects – but, as here, not all the costs – only capital. With roads that means the states do not spend enough to keep roads and bridges in good shape and they have to be rebuilt more often. Bus life in the US had to be reduced from 18 years to 12 years. In Canada the same vehicles are made to last for over twenty years as there is no equivalent federal program. But, on the other hand, the US program at least has a requirement that all spending of federal money on transportation has to be part of a region wide land use and transportation plan. 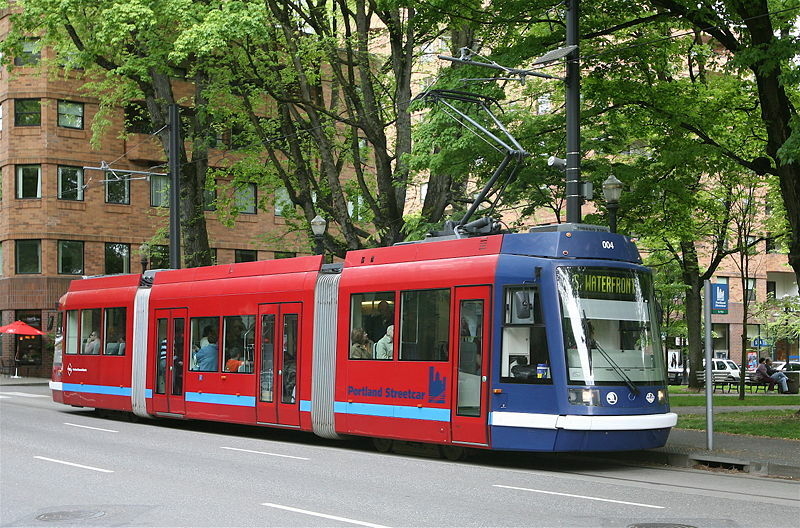 Not that that helped the City of Portland to buy its streetcars. The current arrangement of regional government in Greater Vancouver is a shambles – and results from years of meddling and muddling. Municipal governments have little resources (they get only 8% of all tax revenues) and a parochial mind set. We need regional government that is directly elected and which has its own set of revenues. That is responsible for planning and transportation. That way a regional strategy has a chance of actually getting implemented. Whatever Metro Vancouver may say about sustainability after its years of studies and consultations matters not one whit if the freeway is widened. And if Gordo gets re-elected that is exactly what will happen. Meanwhile, Gordon Campbell — champion of the carbon tax, saint of zero-emission rapid transit lines, friend of the bike path — comes off as an environmentalist hero. Well perhaps in his own mind and that of his funders. But the man who brought us the Seato Sky Highway widening through Eagleridge bluffs and the South Fraser Perimeter Road through both bog and farmland, who decimated the environment ministry rendering enforcement of regulations (also thinned drastically) moot and the environmental assessment process toothless, who is now busy forcing through private sector power projects with no effective local control (and not much justification either) and has wrecked the coastal salmon fishery in his dogged defence of fish farms on wild salmon runs is no hero to any environmentalist I know. At best a few think that a “green power up” is needed to cut greenhouse gas emissions and the puny carbon tax is a small step in the right direction – but few actually give the Liberals an actual endorsement. And of course green activists who run registered charities are very limited in what they can say about politics. And I do not think anyone – and that includes the truckers and road builders – seriously thinks that building freeways improves traffic flow for very long or reduces greenhouse gas emissions at all. Everyone understands that this policy is about gratifying the wish of every driver not to be caught in a jam – but that every road building project simply boosts the need for more road building projects. And at the same time promotes low density suburban sprawl sprawl which threatens agricultural land and green space in general. And locks us into car dependency at the very time when oil production has already peaked, and the threat of runaway global warming has ceased to be distant but is now a current reality. Portland has long had a robust definition of the common good – you cannot do as you like on your own land – and they have worked hard to protect farm and forest land. In the 1970s concern for those areas established UGB. The have the nations strongest land use laws and they have used them to protect single family home neighborhoods. It begins with the premise that they do not try to make Americans feel guilty for driving a car. By creating a livable neighborhood the idea is that you should be be able to get what you need and want within a 20 minute walk or bike ride from your home. Much of the city was built around the streetcar with plenty of corner grocery stores without parking. He feels that the key to the 20 minute neighborhood is to make sure that the corner is rentable at reasonable rate so that prices are fair and commensurate with big box store across town. he feels that subsidizing such stores would be the best transportation investment that we might make. “Most of our trips are about procuring stuff.” Commuting is only about 30% of the trips made. Neighborhoods will be connected by light rail and streetcar. the City spent $125m for 8 miles of streetcar with no federal funding. It was paid fro from a combination of on street parking and garage fees as well as “tax increment” money. “Best investment we have ever made.” Within 3 blocks of the streetcar tracks we had a big invetsment in property. Ridership increased 100% sinc 1989. “Development oriented transit.” The Tram (an aerial cableway) was very expensive but necessary to promote development of an unused area. Portland has the highest percentage of trips by bike in US – about 5% city wide – 12% in core – exponential growth of use of bikeways – will spend $24m on 110 miles of bike boulevards (i.e. a quiet street parallel to the arterial). “We are Liberal and we are progressive” but on a survey of street users bikes were lowest as was freight on the public’s priority list. For most people the highest priority was to fix two bridges. A subsequent survey showed that people who drive cars are scared they might hit a cyclist and people who ride bikes want to avoid mixing with cars. Bikes are a high priority for the Mayor. 20,000 people come out every year for the annual “bridge pedal” a program which closes the major bridges to all but cyclists for one Sunday. It is a “shameless promo”. They also have a TravelSmart trip options program based on Australian experience [Perth WA] program, which he described as a “Concierge” service. “High Praise on a Low Standard”. They have not had a federal government that prioritized these programs. But they need to be humble as i word terms they ae not so far adavanced. They were the first US city to establish a goal to reduce greenhouse gas emissions and have not only reduced – per capita emissions but also and reduced total emissions to below 1% below 1990 levels. By building complete neighborhoods and working hard to provide affordable housing they aim to to go for an 80% reduction by 2050. In 2003 household expenditure on transportation took up 19.1% of the average US family budget. In Portland it was just 15.1%. “I can save you money and make you more competitive ” is a more persuasive sales pitch to those who have yet to buy in to doing the right thing for ideological reasons. This regionwide reduction in what we spend – $800m less than avge city on cars – makes Portland’s economy more resilient since it is mostly spent locally. Car based cities see most of their expenditures go to other places which make cars or produce oil. The message to voters is that Portlanders can have a better life than they have right now. That’s what we work on – satisfaction – quality of life. US Federal “Green stimulus” funds – how does the city tap in to the new federal program? We will get about $2m on energy efficiency projects. We are not spending on City buildings. This is one time money. We using it as seed capital with the local utility companies. Consumers can pay off a loan as part of their utility bill – for homes over 20 years – and this loan is “inheritable” (i.e. it passes to the new owner on sale). the idea is to prove the concept with 500 homes. Residents can increase the energy efficiency of the home with credit up front. [Investment in new windows or insulation] will produce savings for most homeowners. The program does not apply to high rise towers yet. They teed to show that they have a business model that works. So far they are not quite a year in but injuries and deaths from “right hook” collisions at stop lines have been greatly reduced. This was the No 1 issue for bike safety and was based on designs developed in London. Basically a bright green box is painted at the intersection and cars have to stop behind it. The bike lane through the intersection is also green. So far they have seen very impressive resulkts – no deaths and much reduction in injuries. But he warned that you can’t put them everywhere and you need to pick high volume intersections. “Portland is better together” is a web site and a call centre. It means there is just one number to make it easy for people to volunteer. The staff match up volunteers with projects: for example, when they close off streets they use volunteers to do the monitoring> he added parenthetically that in future they will also give universities “real projects” to do. Apparently academics do not always chose research projects which have practical application. “Larry Frank is a wonk. He likes data. We have a high percentage of wonks: they are self selecting. We get 85% voter turnout snce in Portland you can vote by mail over 3 weeks. Make numbers understandable to folks. People who don’t like bikes will spend more to get bikes out of the way. Meet people where they are at.” It is not enough to appeal to the enthusiasts you have got to get the other 40%. “Be responsive, stick with it.” Portland has a progressive business community who not just concerned about the bottom line but the key needs of the community. Do you get push back from less forward thinking officials? We get lots of push back. In fact we seek it out, research it and test it. For instance the traffic enineers complained we spent too much on bikes but in fact it was only 1.5% of the budget. But bikes had a 5% mode share . It thus produces the best rate of return. “Nothing comes close. Get the facts. The cheapest fastest and best trip is by bike.” The big question now is the trip not taken and how to count that? It is much harder to document trip reduction strategies. What do you need from regional plan and how does the City contribute to the region? Some people wanted to expand the RGB. We have been working with other communities to convince them that we have only a finite amount to spend and it gets spread thinner if the boundary is expanded. We want to get them to embrace density and complete communities. We provide technical assistance based in or own experience. The success of downtown has been that it is possible to drive to one place, leave the car there and then get around the entire area. This has been a competitive advantage. The “fareless square” now needs to be expanded as they want to build downtown on both sides of he river but there is a harsh budget reality to set off the inequity of the present system. Bogota has street closures every Sunday. You close eight bridges 1 day a year. Have you thought of doing that? I will let you deal with the church goers. It’s a big cost once a year. We are now closing big swaths of streets in neighborhoods. We are also closing commercial streets one day a month. there is initial resistance but when sales go up resistance stalls. We are now expanding but not to bridges – we will do it in the centers. You mention that the Tram was 4 times over budget. Were there any other initiatives that were worth re-examining? A streetcar line needs to consider cycles as well. We failed there in some locations and need to do future corridor plans up front. We need to get them [tram, bike, pedestrians, trucks] all in the room together. We have a 10 year plan to end homelessness and we are now 3 years in. Around 500 formerly “chronically homeless” people are now in permanent housing. Basically we told the community “you will pay one way or another”. We dropped the “clean up your act” requirement: it is not necessary for the homeless to be clean and sober before they are housed. We are now building a resource access centre which an includes outreach component – go where people are sleeping – do not wait for them to come to you. We do not see the real interest from private sector investors when we talk about buses. We do see development with LRT but only at the stations. You need streetcars to get investment between the stations. A streetcar stops every 2 blocks. 20 minutes assumes every single family home will be within 20 mins of everything and the aim is to drive down the 2/3 of trips that are not for work. The 20 min walk and bike ride areas are different sizes which allows for variation depending on the local physical geography – for examples hilly areas. Portland has now got High Speed Rail designation from the federal government but it is a source of frustration that they cannot get the railroads [to do more to take trucks off the roads] We have to spend [public funds] on private land to get access to rail for freight traffic. We have a “Safe routes to school” program and we hire people to work in schools. They work with the kids to get them excited about walking or cycling to school. They’re willing. At elementary schools they fund bike riding programs and they are only limited by lack of resources. There was an assertive effort for bike lanes on the street. There was a lot of push back and the world did not end. The impact on neighborhood businesses on taking out parking has had mixed results. Our Mayor has promise to make vancouver the “greenest city”. Can you suggest priorities? Guard against the specialist expertise. We need to look at what Portlanders want – consumer analysis. If you look at what each person in a household wants you can identify options they will act on. We had a real success with the rail streetcar. Your regional governance decision making model could be improved. We have an independent, regionally elected government which holds us accountable. This is something you cannot achieve with mayors sitting around a table. How do you attract jobs? Streetcar works for us – we now build streetcars and sell them all over the place. You have the opportunity to market your green services – professional services – but too often forget to market within North America. Provided to you as a public service, this event was not covered at all by the mainstream media – so far as I can tell (i.e. a Google news search found nothing). Vancouver, BC Activists dressed in polar bear suits delivered petitions collected by the Society Promoting Environmental Conservation (SPEC) and the Wilderness Committee to Premier Gordon Campbells office at 12:30 today. Over 10,000 signatures have been collected from citizens demanding investment in public transit and an end to the Port Mann megabridge project. The polar bears highlight concerns about what activists are calling the “Gateway to global warming”. “It will be virtually impossible to reach BCs commitments to reduce greenhouse gases (GHGs) if Gateway is allowed to proceed. Gateway is not just an irresponsible plan, its immoral,” said Ben West, the Wilderness Committees Healthy Communities Campaigner. Environment Canada has stated that the Gateway Program will contribute to a “deterioration of air quality and an increase in GHG emissions”. “If we want to create jobs to turn our economy around then the good news is that investing in transit creates 3 times as many jobs as the same sized investment in highway expenditure,” said Wristen. A recent report from UBC Professor Patrick Condon shows that the entire south Fraser region could be covered in convenient light rail transit for the same cost as the new Port Mann Bridge. “Even if Gateway goes ahead, the Port Mann will be packed as a parking lot again within a few years due to the increased sprawl it will promote. The new mega-bridge will only make congestion worse, and citizens will be left holding the bill and paying the tolls for years to come. This is all preventable since there are very sensible solutions available,” said West. The delivery of 10,000 signatures opposing Gateway in favour of better transit follows the Easter weekend Day of Action which saw activists take to Highway 1 overpasses from West Vancouver to Chilliwack demanding “Rail for the Valley” and “Better Transit, Not Freeways”. One banner from the day of action summed up the feelings of residents saying “Light Rail Cleaner, Safer, Cheaper”. I was sent this by the publishers but only in the last month. I was quite surprised to see that it was now a year old – and it becomes apparent early on that this was written long before the advent of Obama – let alone his election. Because it is written by an American for a US audience. Pat Murphy is the Executiuve Director of Community Solutions, a nonprofit organization which focuses on achieving sustainability by reducing energy consumption in the household sectors of food, housing and transportation. … Community Solutions has hosted annual Peak Oil and Solutions conferences since 2003 in Yellow Springs, Ohio. I was hoping when I picked up the book that I would actually discover an alternative to plan A (Business as usual) and Plan B (New technology). And while there is certainly a well argued case for such an approach there is not nearly enough in my view about how one goes about creating communities in places which have to a large extent lost them. There is of course a great deal of explanation about how we lost our sense of community – and who is responsible for that – but not nearly enough about what we can do to recreate that. In fact this evening – because the CBC is taken over by hockey – I was watching Global TV news and they had a short bit on community gardens in Vancouver (for Earth Day, of course). The demand for these gardens is greater than ever before – and the recession seems to have stimulated even more people to grow their own food. But what got the City of Vancouver really interested was how the establishment of these gardens improved neighborhoods. They made them safer because people started to get to know who their neighbours are. People who had lived in the same apartment building for years actaully found out who the people were on the other floors! We really have very little contact with the people who live closest to us – and gardens do build communities. This simple idea is not referenced at all in the index to this substantial (300 page) volume. How to start building a community seems to me to be the key to getting Plan C working. There is a lot in the first third of the book which makes it a useful reference source – the whole thing is annotated in endnotes – but much of it will be reasonably familiar to people who have been concerned enough about the problem to pick up this book in the first place. Since it is American it has to deal with the widespread misconceptions about climate change and peak oil – but if you do not need to be convinced you may skip that part. It will also mean you can avoid a long and quite vitriolic condemnation of the history of imperialism – which to some extent explains why the third world is so angry that the first world seems so determined to hold back their achieving our lifestyle. But there are odd gaps – for instance the very short section on electric cars omits the current organizational developments in Israel around leasing batteries which may well overcome the serious issue of lack of range. And unfortunately the book misnames “the father of the fuel cell” George Ballard (he was actually Geoffrey Ballard) – and also neglects to point out that Ballard Power Systems themselves have abandoned the idea of developing a fuel cell powered car. I naturally turned to the transportation section hoping for better. But nearly all of it is devoted to the idea of the “smart jitney”. Now this is an idea that I have also thought would be very useful in civilizing suburbia, and technically I think it would be reasonably easy to do. The problem is the very real legal and social barriers. In my own view, this is going to be a very hard sell to politicians – and against the considerable and well entrenched opposition of people who currently operate both taxis and transit. We do need something that is smaller than a bus and cheaper than a taxi – but I think that self drive vehicles are still going to be the answer (through car co-ops) long before we resolve the issue of getting into a car with a stranger driving. Since the book is about community organizing most of the obvious ways of improving local transportation through better transit are simply ignored. About the only extensive reference is to what Cuba cobbled together when it lost access to Soviet oil. Apparently one of the essential things we must do is “kick the media habit”. And, yes, I can see why that would be a good way to reclaim some time and get away from the very narrow world view presented by the mainstream media. But it also seems to me that is a very patrician view: that most of us are incapable of seeing through the spin and sorting out our own alternative sources of news. For people who can find their way around the internet there are many other ways of getting news and information. But according to Pat Murphy you have to get away not just from the tv but your computer as well. As a blogger I cannot recommend that approach. And as an activist, and now an aspiring politician, I am also not ready to give upon the political process. Much of the change we need to bring about needs to be at the various levels of government. Much of the first Greenhouse Gas Action Plan for BC that I worked dealt with regulatory issues – and many of those still need to be dealt with. For instance rules that prevent people from taking simple effective steps to cut energy use like using a clothes line or installing a solar panel. But also of course stopping governments doing stupid things like widening freeways and getting them to do sensible things like converting more of our streets to bus lanes. I think there may well be a Plan C – and it does have a lot to do with people discovering the power that they still possess when they get together to do things. Stopping a P3 in a provincial park for instance – but also positive things like organizing car pools and community gardens. There does need to be a handbook to help that along. This is not it. Cars and trucks will be crossing the new Port Mann Bridge a year earlier than promised, but transit riders may be out of luck without substantial new funding for bus services. Ken Hardie, a spokesman for TransLink, said in an interview that the agency is facing an annual shortfall of $150-million based on current demand, and it will have evaporated its reserves within two years. To pay for the additional services that have been promised across the system, it would need to find an extra $300-million each year. “We have been lavished with funding from the federal and provincial governments but it’s all for capital costs,” he said. The cost of operating the buses is the more significant part of the equation, he said. This, of course, is not news. It is a reaction to the province’s announcement that the bridge will be “open a year early”. (It will also be slightly cheaper – interesting how once the P3 was cancelled it got both faster AND cheaper). Obviously Translink was not consulted – because they are still in the throes of trying to get people interested in their “long term plan” – when the real question is the short term cash crunch. Equally obviously it really does not matter what the agency wants to do – now or in the future – since it can only do what the province decides. And that is never based on regional priorities but short term political advantage. And both the Liberals and the NDP play that game. And, once again, Kevin Falcon is out there lying in his teeth. Transportation Minister Kevin Falcon vowed the promised rapid buses will be running on the new bridge. He said the province will pay part of the cost, but it is up to the regional governments to find their share as well. He said there has been no regular bus service on the existing Port Mann Bridge for two decades because of chronic congestion, and the increased transit services are a key part of the government’s climate action agenda. There has been no regular bus service since the previous one was cancelled due to “low ridership” after the Expo line was extended to Scott Road. And since Translink was told not to introduce a direct North Surrey to Coquitlam bus by Mr Falcon’s minions. “Chronic congestion” is not an excuse used for taking off bus service – and has never been used on any of the other very congested routes. What is done is that bus lanes are put in – just as the province is now doing on Highway #99. They have long been needed on the northbound approach to the Oak Street Bridge but are only now under construction as an afterthought, to deal with South Surrey and Delta express buses being diverted into the new Canada Line station at the casino. Increased transit service is also an afterthought. Since the main plank of this government’s transportation objective in this region is to increase traffic . Again, they lie about that, saying it will reduce ghg emissions as traffic will flow better on a wider freeway. But of course we all know – as do they – that has never happened anywhere. Last night I watched “New York: A Documentary Film” on KNOW. It was about the new bridges and freeways built by Robert Moses in the 1930s. Same justification as Falcon and Gordo still use – it would “solve congestion” and be a useful stimulus in times of economic depression. But soon after the Triborough Bridge opened, New York experience the worst traffic jam in its then history. Because new highways and bridges generate more trips. There is always more traffic when networks are expanded. People use their cars more when offered new trip making opportunities – and those trips are usually longer. Congestion eventually settles back into a sort of equilibrium. As long as there are no major incidents, traffic reverts to about 10mph on average in nearly every city on earth. Enough people give up marginal trips, and enough people insist on driving to ensure a level of not too much misery every day. Until there is a collision. Or a truck overturns. Or the potholes need fixing. He is right, the people do want transit. They have been wanting it for years. And the provincial politicians have preferred to build roads and bridges. Because that helps their friends make money (Moses was very popular with the construction companies). And they have always told municipal politicians that their voters will have to made to pay more for transit and at the same time refused to sanction new revenue sources. Of course what is really needed is to cancel the Gateway altogether and spend the money on more buses – and trains for existing tracks – as well as putting in measures that reduce the amount of space devoted to cars in order to increase the people carrying capacity of the network we now have. With a few strategically placed queue jumper lanes and a few more “traffic meter” stop lights on the on-ramps, Highway #1 is quite adequate as it is. Because – as Gordon Campbell says – a rapid transit line can carry the same as ten lanes of freeway. If it has enough trains or buses that is!